The writer’s notebook is a key piece to a workshop classroom. Whatever you call it–response notebook, reader’s/writer’s notebook–the idea is that it becomes an extension of a student’s brain, the place to work out ideas, reflect, plan, wonder, ponder, keep track of, etc. I’m still learning as a writer’s notebook user myself. I’m filling them more quickly than I used to, which makes me happy, but I’m constantly discovering how to use the tool best for my own growth as a reader, writer, and thinker. It has helped this year to do some thinking alongside Stevi Quate, one of my personal teacher mentors (she was my secondary English methods professor back in 1995 and is now my colleague in the Colorado Writing Project–see her post about launching the writer’s notebook). I am definitely still learning as a writer’s notebook user. And I am definitely still learning about how to invite my students to use them most meaningfully. Here’s what I did this past year in AP Lit to invite my students to develop extensions of their brain in the form of a composition notebook. Every August, I hit the local Target when they have just stocked school supplies and I purchase 50 composition notebooks at the cost of 50 cents each. I offer these to my students–they can have them and throw 50 cents at me if they wish. One of my very first assignments in my class is to show up with a writer’s notebook in-hand. Having them right there for students makes this super easy. 2) Make writer’s notebooks a central focus. I have a set of learning objectives for each of my classes, but there’s always one goal about writer’s notebooks. My students choose three focus objectives for themselves each semester. They track their growth toward their chosen objectives. Making one of these a goal about writer’s notebooks shows students that they matter, that they’re important, that they will be a central component of the course. I never walk into class without my own writer’s notebook. I want students to see it as an appendage of their teacher. I use it constantly–I make lists, keep track of things, take notes on class discussion, make plans–I tell my students what’s going on in my writer’s notebook and even show them sometimes. If it’s important enough that I’m asking them to get serious about a writer’s notebook, then I should be doing the same. Different this year, I told my students that the writer’s notebook is the one thing that they need for class (that and whatever novel we’re discussing together). I wanted it to be THE thing that held all of their resources and information for class–no additional binder or folder needed. 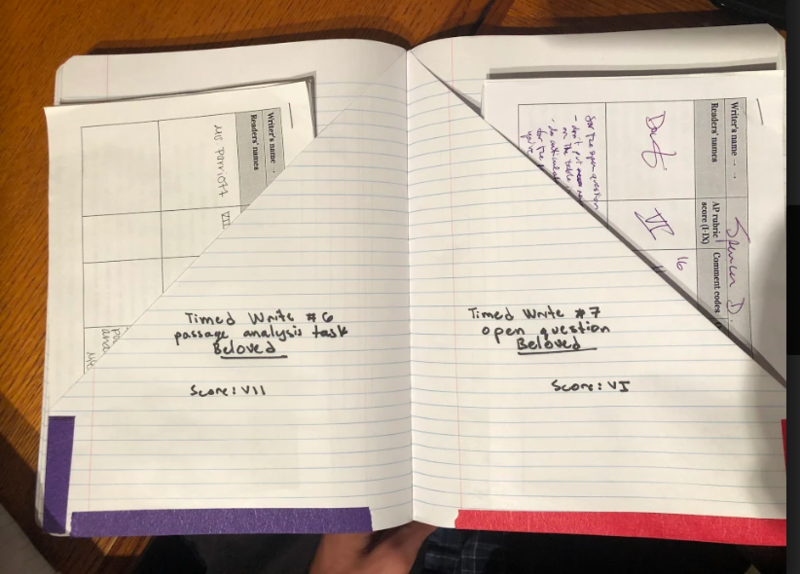 After discovering biology teacher Lee Ferguson’s resources on interactive lab notebooks, I was able to show my students how to make pockets to hold onto any resources I give them and to file away their timed writes. One student’s pockets in his writer’s notebook where he stored his timed writes. I also frequently provided items on half sheets of paper and asked students to tape or glue them into their writer’s notebooks–the learning objectives for the semester for example. Then they could circle or highlight their chosen objectives and do some annotating right there about why they chose those particular learning objectives for themselves. I also loved giving them poems to tape in and write all over. Freshly stocked buckets full of writer’s notebook supplies. Another new thing I tried this year was providing colorful tape and tabs and stickers for students. 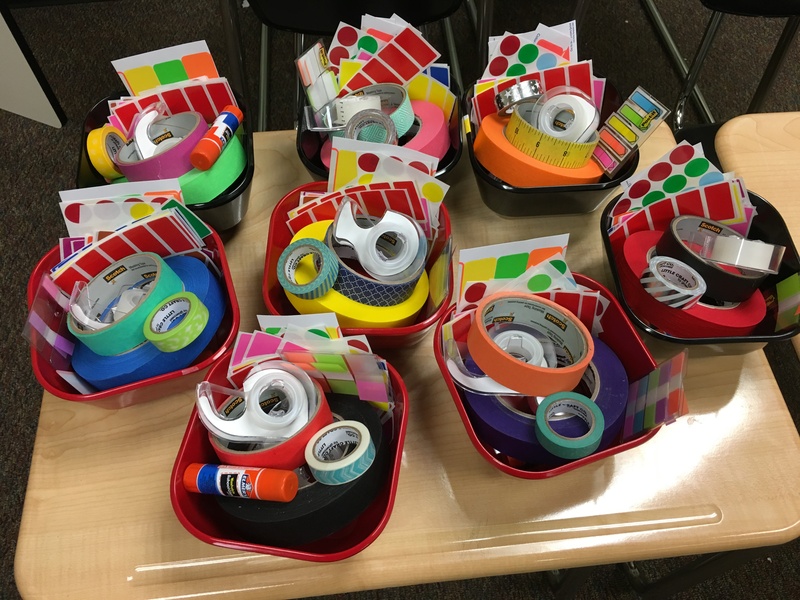 I created eight “buckets”–one for each pod of students in each class. I stashed them away in the closet in my classroom and pulled them out on the days I knew they would need them, but my students knew that they were welcome to grab a bucket at any time if they needed something for their writer’s notebook. I found colorful masking tape and washi tape online for the best prices. And my students’ favorite thing beside the tape was those little, round, brightly-colored price tag stickers that you might buy if you’re having a garage sale. They used them all over their notebooks for a variety of purposes. The bowls came from Target–less than 2 bucks each and in our school colors. 3) Ask students to complete writer’s notebook tasks that invite them to do the kind of thinking work that would make the notebook an extension of their brain. To help us think about the books we studied: From Socratic Seminar tickets to Socratic seminar notes to notes on class discussions to free writing in response to the reading, I asked students to use the writer’s notebook as home base for all of this. Take a look here at how a few students approached this. To help with the writing we did: Students used writer’s notebooks to prepare for timed writes and to prepare for the AP exam. They also did a lot of thinking/planning for the semester-long piece of writing. See a few examples here. One student’s page to track her reading goals for the semester. 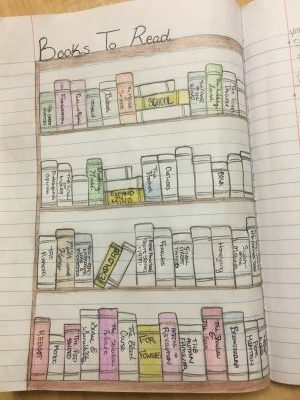 The yellow book on each shelf identifies a unique reading goal–“school,” “expand my mind,” “explore,” and “for funsies.” She colored in the books when she read them. To track growth toward students’ individual learning objectives: A few weeks into the semester last fall after students had gotten used to what the work of the class looked like, I had a day in class where students chose their learning objectives and we talked about how they could use their writer’s notebooks to track their progress and growth. Students did a variety of things, but my favorite was the book case that one student drew, each shelf a unique set of books toward a certain reading goal she had, particular titles written on the spines, books colored in when she read them. Awesome! I also saw calendars where students made regular notes about their learning goal progress and pages where they collected evidence of how they were doing. I blocked out time in class for students to show each other how they were using their writer’s notebook to track their learning so they could steal each other’s awesome ideas. To stay organized: Students made tables of contents and tabbed sections and numbered pages and clearly labeled items and even used different colored pens for different purposes. I made a few general suggestions for how to approach staying organized and talked through my own strategies. 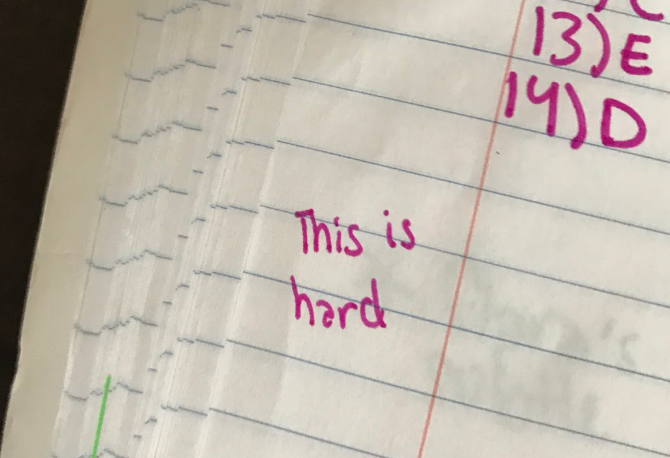 This was in the margins on a page where she was writing down her answers for some AP exam multiple choice practice that we were doing together in class. I love the simple honesty of this, how it captures what she was thinking at that moment. Yes, the work we ask of students in AP Lit IS hard–close reading of complex text for the purpose of articulating your own interpretive analysis of it? Difficult indeed. If you’ve read any of my blog series on grading, you’ll not be surprised that I use no rubric, assign no points, or even “grade” writer’s notebooks at all. Having and using a writer’s notebook is a requirement in my class that I monitor every single day in my class. But I never collect writer’s notebooks. I consider the writer’s notebook the student’s individual space. The very first year I used them years ago, I collected them every so often figuring that I needed to make sure students were using them for what I was asking them to use them for. This was also a few years before the moment I stopped grading traditionally, so I was in a different mind frame about assessment and grading–needing to hold students accountable for the work via points and grades. But here’s what I noticed that first year when I collected students’ writer’s notebooks: they didn’t seem very authentic. They didn’t seem like the students were really using them in genuinely meaningful ways. The reasons for this are many I’m sure, especially that I wasn’t very good at inviting students to make them meaningful. I’m learning and getting better at this. There’s something powerful for students when I tell them that the writer’s notebook is THEIR space. They control it. They design it. They determine how integral it will become to their work for the class. At the start of this semester, I wrote in my writer’s notebook that I wanted to use my notebook to “write about ideas of my own” because I am often too intimidated to discuss my own ideas about books in front of the whole class. I have found my writer’s notebook to be a valuable space where I can write about and expand on my own ideas without feeling nervous to share my ideas with the entire class. I turned my writer’s notebook into a extremely helpful resource that I have used throughout the semester to keep track of my thoughts about books, as well as a space to plan for and brainstorm about timed writes. Last semester was the first time that I was able to have a journal I stuck to and filled out almost everyday and I was able to carry that into this semester as well. I think the main area of improvement came in the relevance of everything I wrote down this semester. I did a better job of recognizing what I already knew and wrote down things that really mattered to me. Likewise I tried to recognize what I didn’t know and needed to work on, writing it down more thoroughly. I continued to take extensive notes for socratic seminars and book discussions. I continued to write free writes and poetry in my blank pages and my favorite part of my writer’s notebook this semester would definitely be that. I think this learning target has really helped me with organization and understanding what I do and do not already know. I have put a lot of work into maintaining a writer’s notebook that illustrates my ideas. In my writer’s notebook, I have jotted down my interpretations of class text and taken very detailed notes for all of our class discussions and socratic seminars. For example, for each of the discussions I have jotted down important points that other people have started and then made individual interpretations of those thoughts, such as making theme statements based off of presented ideas. It has also been a place where I can store class handouts and mt timed writes. In having all the information I need for this class in one place, I have had a very easy time looking back on my notes and handouts and using them for other activities. Overall, my writer’s notebook has been a very useful tool for me regarding my growth as both a reader and a writer. I chose this as another one of my learning objectives because I wanted to have a vibrant writer’s notebook that I could constantly reach for when I had an idea, or was struggling to find one. To better understand class discussions, various texts, and possible themes, I found it very helpful to write it all down. This really helped me track my growth and understand what I needed to improve on in all subject matter. I initially wanted to work on this learning objective because at the beginning of the year, I felt like I was forcing myself to work in my writer’s notebook. I did not want that to be the case. Fortunately, I now recognize the effectiveness of journaling your thoughts. In addition, keeping an extensive writer’s notebook better prepared me for the AP test at the end of the year. Through collecting data on all of our books and discussions, I was able to go into the test with something in mind to write about. I aim to do a better and better job each year of figuring out how to invite my students to make their writer’s notebooks the thinking space they need to support this difficult but worthy work. What are your strategies? This entry was posted in #WorkshopWorksForAP, AP Lit, blog series, engagement, motivating students, summer 2018 blog series, teaching reading, teaching writing, workshop teaching, writer's notebooks, writing, writing with students. Bookmark the permalink. Sarah, I love how you want students to see the WNB as an extension of their brain, and, according to their responses, it sounds like they get it! Thanks for reading, Stevi! Those students definitely got it. I want to work toward getting more and more of them there in the future.